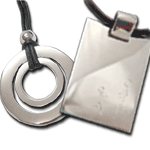 Well... Father’s Day is only weeks away and we are offering 20% discount plus free shipping on our Sterling Silver “Dad” and UNIDOS pendant necklaces (see pic below) to celebrate! These beautiful pieces are personal, unique and will make for a great keepsake with the option to engrave your children's names and date of birth on each piece. Give Dad something he can treasure and wear with pride! Offer valid until 30 September, 2010.